Combine sea salt and water in a glass jar and mix until salt is completely dissolved. Set aside. Grate carrots and measure out 4 cups of grated carrots. Add grated ginger to carrots and place into fermentation jar. Press down firmly to pack down into jar and remove any air bubbles. Pour prepared salt brine over carrots until water level is just above the level of the carrots. Gently tap jar on the counter to remove any trapped air bubbles. Be sure to leave room in the jar as the carrots will release more liquid. Place airtight lid fitted with an airlock onto jar and allow to sit on counter for 3 days. Be sure to cover your fermentation jar to block out any light. Transfer to fridge when done. Enjoy! Just started a batch of carrot, parsnips & ginger…. Wow! I fermented for 10 days and it tastes amazing!!!!! I feel like I should have made more because Im gonna go through this fast. I was a little skeptical about the scum on top, it reminded me of kombucha. I just scooped it off and tasted yumminess underneath. I will definitely make this again. 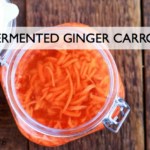 The fermented ginger carrots are a great way to introduce people to fermented foods becausee they are a bit sweeter and milder than sauerkraut. 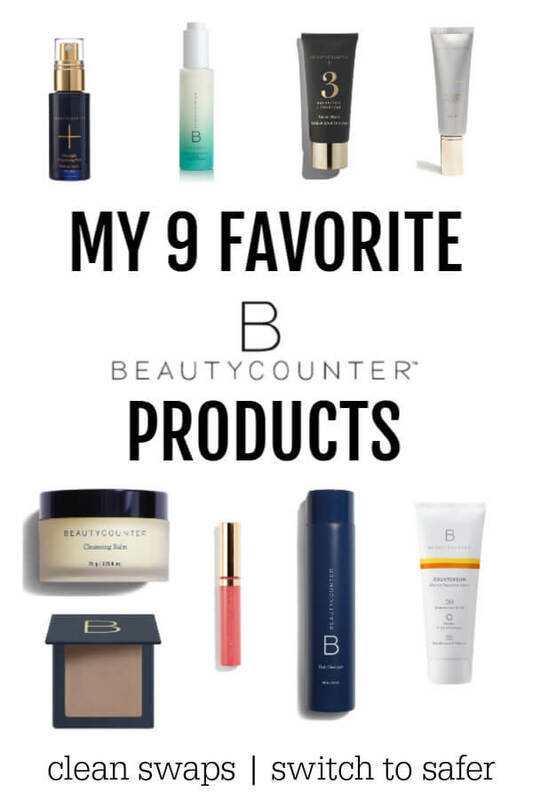 I would love to hear if you try this…. I am definitely planning to try this! 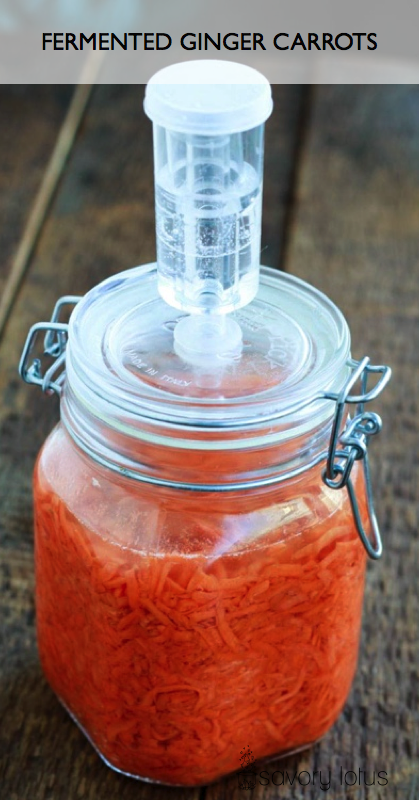 I have never tried fermenting anything before, so I am a little apprehensive… Since I do not have any natural previously fermented vegetable juice, can I use the juice from the Bubbie’s Saurkraut that I have in the fridge, or should I use whey? And, if so, how much? Thanks! Argia- You can totally use the Bubbie’s juice. Even if you didn’t add any sauerkraut juice or whey, the kraut would still ferment. Let me know how it goes. Thanks! I will definitely let you know. I just made a batch of the fermented ginger carrots.. You say to “cover loosely” If I just lay the mason jar lid on to of the jar, is that ok? Or, how do you cover yours? Thanks! So, Friday was day 5 of the carrot/ginger fermenting process. I skimmed off the top layer. Since I have never done this before, do I need to be sure to get all of the residue from the top? I am going to try to insert pictures if I can. I have sealed the jar and placed it in the refrigerator… I haven’t tried any yet. Note – I had already removed most of the residue when I thought to take a picture. My carrots do not usually develop a residue on the top. Like I said, I leave them out an average of 3 days. If you have a lot of white film/residue, you may not have added enough salt OR it was left out too long. I would experiment with 2-3 days and see if that works better. Be sure that the carrots are submerged the entire time, the jar is covered, and that you are using clean jar and utensils. Let me know how it goes. These are my favorite because they are ready in just a few days and taste so yummy! Just made these three days ago. Lid just sitting on top, covered with a cloth to block out light, checked each day to make sure carrots are submerged. Today the liquid is….snotty. Bad word, but that’s the consistency of it! It this normal? Can I just put them in the fridge? It’s a little weird to get a spoonful out and have a long trailing line of the liquid follow! Hi, there! I consulted with my fermentation guru and she states, “The “slimy mess” are the dextrans and pectin that are produced, a natural part of carrots. They will NOT always form. Formation depends on sugar-amount, temperatures, and length of fermentation. The longer you ferment, the more the dextrans/pectin will be broken down back into less offensive liquids. I actually love using the thickened carrot drink as a base for making salad dressings. I add raw egg, coconut oil, olive oil, splash of fermented garlic juice, etc., and balloon whisk into a dressing. Pectin of the onion, beet, apple, carrot, etc., is soothing to the gut, and it is mucous forming. That mucous is helpful in lining the gut and protecting it. Hi, Erin! Yes, I found this comment in the spam folder. So I have made this several times in lots of different jars. I used to just place a plastic canning lid on loosely. It turned out fine sometimes, and sometimes it didn’t. That’s the problem with not doing totally anaerobic fermentation. No real control of the environment. I have stopped recommending sauerkraut juice for the same reason. Too many variables that cannot be controlled. Hello! I just remembered to come back and check. 🙂 Thanks for the reply! I haven’t seen anything like those canning lids but I’ll look harder. I’m now just a few months away from a visit to the US so I may just order a Pickl-it to bring back. It’s so frustrating when things get moldy! 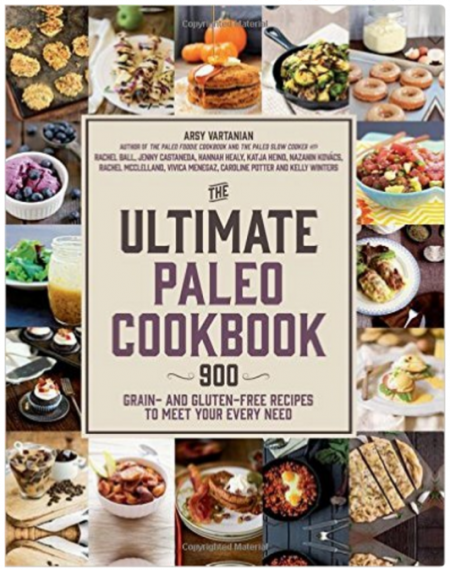 I’d love to eat some fermented foods but it’s difficult when nothing I try works. 😉 Thanks again! I juice fresh organic carrots and when I’m done, I have great juice and a bunch of finely grated carrot fiber. Sometimes I add the fiber to salads, stews and meat loaf, but I was wondering if I could use this fiber to ferment instead of grated carrots. I have not tried it but would love to hear if you do! I made a large batch of carrots / ginger…i got the slime. It has reduced a bit, smells absolutely fine. I took some carrots out and they feel a bit slimy. What do you think – good, or toss. Kind of afraid to taste…..
Hi, Eric! I used to think the slime was bad. Recently I have learned that the slime is a naturally breakdown of the pectin in the carrots. I am still researching this as I sometimes get a slimy batch. According to my fermentation expert, it is still safe to eat. I have definitely eaten it, but am still researching to learn more. I have tried this twice and gotten the slime- the first batch I threw out- and I just tried again does that mean something went wrong? should I wait longer? Check out my previous responses to m=comments. I have recently learned that the pectin in carrots creates this “slime” sometimes. This is normal and OK to eat. It’s a weird concept for me, but I have eaten it. Hope that helps.